Adam Retort Biochar Kiln Shed Just in time for summer. Adam retort biochar kiln used to sit out in the weather and await its fate. Well it has been nine month’s since we started this project and at long last it is now complete. I think the main reason why nothing happened for a long time is the shed itself had chosen the builder it wanted to build the roof so it new it would get quality workmanship. So over the 9 months we have had many starts on it with many builders who said they knew what to do when they really did not. But this time over the weekend we saw the project completed in enough time for the rainy season. Big thanks goes to Paul, Jim and Wombat for sticking to the job and making it such a handsome shed. 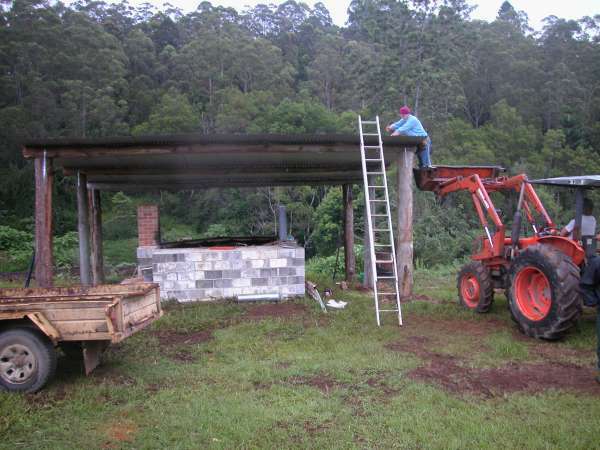 I just need to fasten a pulley above the kiln door and a winch at the back of the shed to lift the moster 180kg kiln Lid. Then this project is complete. once wet could take a further 4 hours of burn time to dry out again so this has hampered our use of the kiln. We plan to do a big run this week and video the choice parts and record the data so Uncle Buck can enjoy the event from his arm chair. I am really elated and full of happy energy to see this finished. 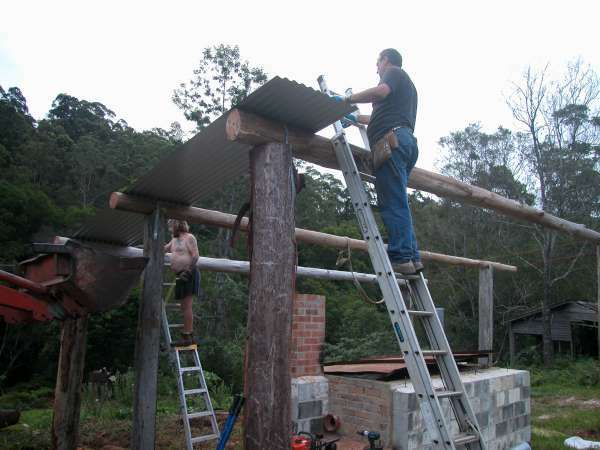 I will create a vegie patch behind the kiln so that the water that runs off the new roof can feed my veggies for me. As usual the hill of abundance has provided everything we need for free and I wish to use this moment to thank the universe for such a great couple of days. Thank you Universe. 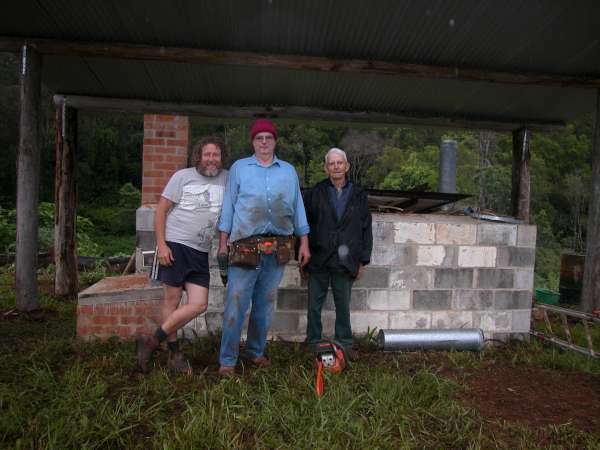 I have talked with Paul at length and he would like to help me build the sustainable biochar education centre hall when it is time for that project to start. 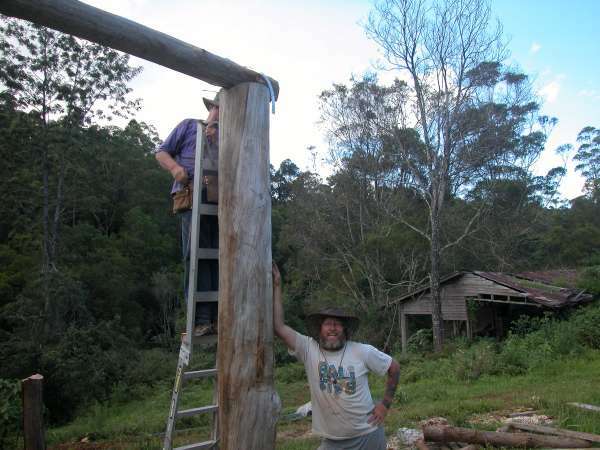 So look out as we create a truly sustainable building for biochar education and advancement. Big rustic and bold will be the order of the day. 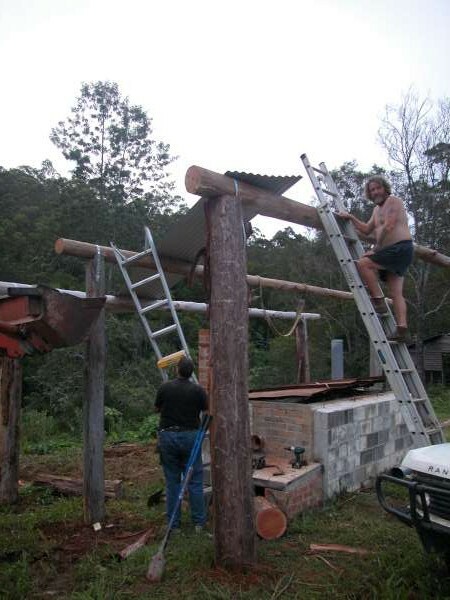 I have been researching re the Adam retort and found this biochar site and your interesting experience building the retort.Would you have plans available on how to build this retort. We would wish to replicate it here in Negros the Philippines to addres the need for sustainably and carbon neutral production of charcoal which as a popular fuel for domestic use, moreso that liquified petroleum gas has become prohibitively expensive and households are resorting to the use of wood and charcoal. There is a local community fabricating bricks wher we could source these from. Next post: Bush mechanic. Seeing the new in the Old. 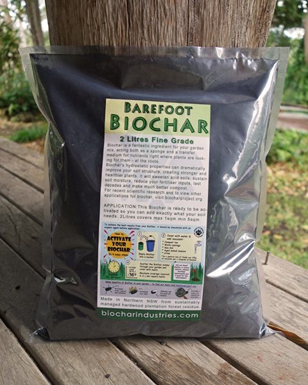 Previous post: Biochar Industries – What is it ?